This post Is for those of you who’ve dabbled at matched betting at some point, but not really exploited It to the max. With the proliferation of new Matched Betting services popping up, and hearing the success stories, I’ve decided to take another look at this bookie bashing marvel. The principle of matched betting Is very clever. 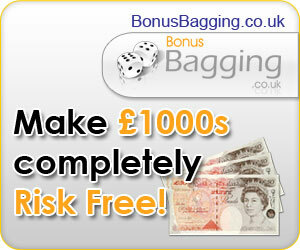 You take advantage of bookie bonuses, whether they be sign up offers or reload bonuses. By laying these bets off on a betting exchange, we can usually make a small loss from the qualifying bet, In order to get a guaranteed FREE bet. With this free bet, we can make some real money. Obviously these are small bonuses, and soon I’ll be taking some of the larger £30 and £50 bonuses. It makes sense to build the bank with these smaller bets until the bank can support these larger liabilities. Although you can get started on your own, I recommend joining one of the many matched betting services. These services keep you updated with all the latest bookmaker bonuses along with Instructions on how to trade out the profit. You’ll also find the relevant calculators and generally a forum which Is full of member stories and experiences. My favourite service is Profit Accumulator as It has the best forum, which Is always lively and engaging. One feature I really like about this service Is the spreadsheets which can be used to track where your money Is at all times, along with your profit. A very useful feature. What I particularly like about about matched betting, Is the fact that It can be done any time of the day or night. Unlike trading, where you have to be there for the event, matched betting allows you to place your bets and walk away. This Is why so many people are doing this, literally everybody has time to make money with this. Just half an hour a day Is enough to bring in hundreds of pounds monthly. For the more serious bettor, Incomes of up to £4000 a month are currently being achieved. That’s a serious Tax Free income from a few hours a day whilst watching television. The downside to betting In this manner, Is that you will have some accounts closed. This can obviously effect your Immediate Income. Some users recommend using multiple accounts, but this borders on being Illegal and I can’t recommend that. Most use mug bets to try and distract the bookie, but these guys aren’t stupid. They know what you’re up to. Personally, I wouldn’t worry about account closures, as there are new bookmakers opening almost weekly, which can take their place. I’ve spoken to a number of people that consistently make four figures a month. They all advocate having a bank of around £5000 to achieve this consistently. I’m sure that this Is really required because their money Is constantly moving between accounts, and the majority Is used as a float. Don’t let this put you off though, you can easily get started with just £50 or so, and build your bank from there. Matched betting really Is accessible to all. I really like matched betting, there is far more opportunity now than when I first looked at It years ago. People are really pushing the boundaries with It now, and some of the Incomes are eyewatering. I’ve decided to start again, and take this a little bit more seriously. Even making just £20 a day will bring in £600 profit each month and that’s a mortgage payment ere up north. If you could do with an extra £600 Click Here. So lets get to the nitty gritty, anyone can start to make money with Matched Betting, there really are no barriers to getting started. It’s within anyone’s budget, It can be fitted In around anyones schedule, and It’s profitable within hours. It really doesn’t get any better does It? The only downside (and It’s not really a downside) Is the tiny monthly fee to get the latest offers, calculators and help from your chosen matched betting subscription. Bearing In mind that a single bet will cover this cost, and that with this Information, you could make a full-time Income starting today. Can you imagine making your days profit target sitting in a coffee shop with your laptop? Spending time away travelling? As long as you have your laptop, then you’re In business. It appeals to me as I enjoy getting out and about. I’ve spent years sat behind a desk at work, envying those that seem to be free from the shackles of an employer. Like being self employed, the more work you do, the more you’ll get paid. If you’ve not looked at matched betting for a while, then I’d seriously consider taking another look at It. I’ve been blown away at the many stories I’ve read recently as well as the people I’ve spoken to that are currently doing this. It’s certainly going to the forefront of my activities, as I’m quite risk averse by nature, and this ticks all the boxes for me. Lets see if I can get to the elusive £1000 a month. Keep checking back as I’ll be updating my progress, both good and bad. I’d love to hear of your experiences, so please either leave a comment below or email me.